This fifth report in ISPU's 'Reimagining Muslim Spaces' series presents a case study of the Islamic Society of Boston Cultural Center (ISBCC), the largest mosque in New England. 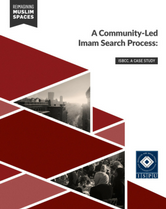 Specifically, we examine how ISBCC meaningfully engaged its community in a thorough and multi-tiered imam hiring process led jointly by the mosque leadership and community. In presenting the findings from this case study, it is hoped that American mosques struggling with finding and retaining suitable mosque leaders will be able to learn from the process outlined here, and tailor it to best meet their own community's needs.